Cut off the stem ends and force fruit through a food mill or a coarse strainer. Pour four cups of persimmon pulp into a deep saucepan. 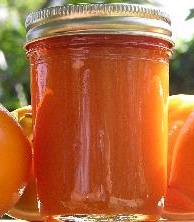 Combine the lemon juice and pectin to the persimmon pulp and mix very well. Heat the mix until it is boiling, while stirring constantly. Keep it boiling without stirring for about five minutes. Remove the mixture from the heat on the stove, and alternately stir and skim for five minutes to cool. Spoon into hot sterilized jars and seal. This was a great recipe. I added cinnamon & it turned out great. looks yumm... my kid would try this one. This recipe looks so easy and sounds so yummy. 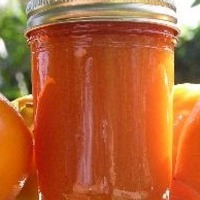 Cant wait until my persimmons ripen and i can make jam!!!!! Thank you for posting it. I will let you know how it turns out. 4 Weight Loss Myths Debunked From Celebrity Trainer Cat Smiley!